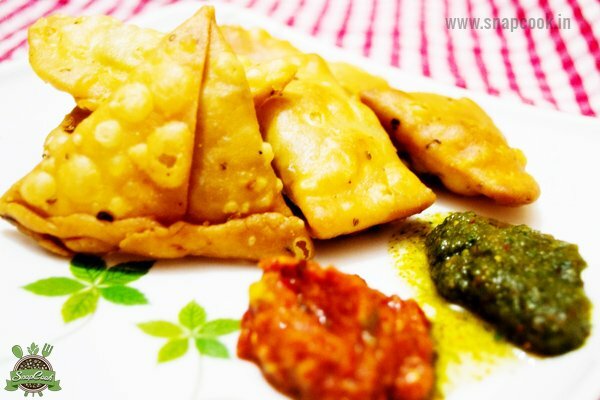 A tangy, spicy onions stuffed in puris, to make a crispy pyaz ki kachori. It is common rajasthani sanck, now become a common snack of all. Oil 2 tablespoon (to add in the dough), 1 tablespoon for making the onion mixture. Now heat 1 tablespoon of oil in a kadai. Add cumin seeds, asafoetida, mustard seeds, fennel seeds and coriander powder. When they starts changing the colour, add chopped onions. Saute onions till they change the colour to brown. Now add salt and red chilli powder. Fry it and keep aside this mixture to cool for 15 minutes. Smear your palm with little oil. Take small dough and make small small puris (very thin). Now put a little mixture of onion mix on it and fold it in any shape of your choice. Seal it using little amount of water on edges or u can seal it after folding the edges. Now add kachoris in the batches of 7-8 and deep fry on low flame till golden yellow in colour. Drain on a tissue and serve hot with chutney.